After the Spanish-American war, Spain ceded the Philippines to the Unites States for a amount of 20 million dollars in the 1898 Treaty of Paris. The currency situation was in a state of disarray. The colony needed a new working coinage system which showed the colony's new identity. 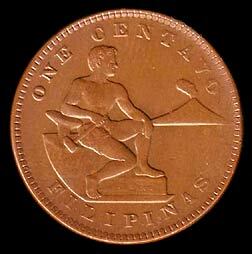 In 1903, all Spanish-Philippines issues were withdrawn from circulation and melted, replaced by the new series of coins. The minor coins (the half centavo, one centavo, and five centavos) were made of bronze and featured the figure of an adolescent male seated at an anvil and holding a hammer in his right hand. In the distance is seen the smoking volcano of Mt. Mayon. The statement of value appears in English, while the name of the colony is written below in Spanish (FILIPINAS). Silver was used for the larger denominated coins (10, 20 and 50 centavos and then the 1 peso). The obverses of these showed a standing figure of a female wearing a long gown and holding a hammer resting atop an anvil. Behind her is again Mt. Mayon. 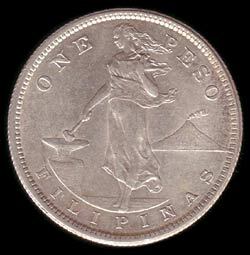 Until the Philippine Commonwealth was founded in 1935, all coins bore a single reverse design: the federal shield with by an American eagle on top. The words "UNITED STATES OF AMERICA" and the date the coin was struck are also found on this side. 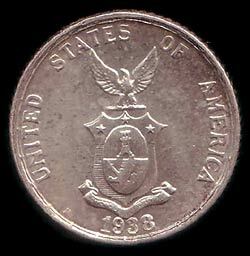 The obverses remained unchanged until the last US-Philippine coins were struck in 1945. The designs are credited to Filipino sculptor Melecio Figueroa. Several US mints struck coins for this series, namely Philadelphia, San Francisco, Denver and the Manila mint. A vivid relation about the introduction of the US-Philippine currency can be found in chapter XII of Mary Helen Fee's book, A Woman's Impression of the Philippines. She was a teacher who was send to the Philippines in the early years of the US era. One of the most irritating features of life in those early days, and one which offered a problem rather difficult for the Government to solve, was the matter of currency. The money in use was silver, with a small paper circulation of Banco Espagnol-Filipino notes. The notes were printed on a kind of pink blotting paper which looked as if it would be easy to counterfeit. The silver was what we called at first "Mex" and later "Dobie." There were some pieces coined especially for the Philippines, but in general "Mex" was made up of coins of Spain, Mexico, Islas Filipinas, Hong-Kong, Singapore, Canton, and Amoy--only the experts of the Government could tell where it all came from. 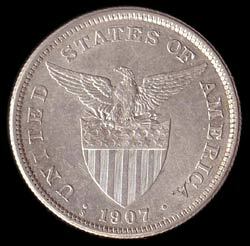 With the public at large, any coin that looked as if it contained the fair average of silver was accepted. Every month the paymasters of the United States Army and Navy issued thousands of dollars in American silver and paper, but this disappeared in a twinkling, swallowed up by the local agents who were buying gold with which China paid her indemnity. Each incoming steamer brought loads of "Dobie" from the Asiatic coast, but our good dollars and quarters went out of sight like falling stars. The silver coins consisted of pesos, medio-pesos, pesetas (twenty-cent pieces), media-pesetas (ten-cent pieces), and it seems to me that I have a hazy recollection of a silver five-cent piece, though I cannot be certain. The copper coins were as mongrel as the silver. There were English, Dutch, Spanish, and Chinese coins from the neighboring coasts, but the greater part of the copper coins consisted of roughly pounded discs with ragged edges, which were made, they said, by the Igorrotes. The coins had no inscriptions, but went with the natives by the name of "dacolds"--the native word for "big," The Americans renamed the dacolds "claquers," and used either name at pleasure. It required eighty dacolds to equal one peso, forty to a half-peso, sixteen to a peseta, eight to a media-peseta. Theoretically a peso was a hundred cents, as a peseta was twenty cents, but there was no cent with which to make change. You accepted the dacold at its value of eighty to a peso, or you transacted no business. The Filipinos also had a way of figuring a medio-peso as cuatro reales, thus giving the real a value of twelve and a half cents, though there was no coin called a real. Nevertheless, the real figured in all business transactions. At the time we landed in Manila "Mex" stood with gold at an even ratio of two pesos "Mex" for one dollar gold. I innocently allowed a bank to transfer a gold balance on a letter of credit to an account in local currency at that ratio. A few weeks later, when I wanted to change back and carry my account in gold, they wrote me courteously but firmly that I would have to buy back that account at the ratio of 2.27, and by the time that the transfer was finally effected, gold had jumped to 2.66. We had been told by a circular from the War Department, at the time our appointments were made, that we should be paid in gold. I drew just one cheque in U.S. currency after reaching the Islands. My second cheque was drawn in local currency at a ratio of 2.27, but, by the time it had reached me at Capiz, gold had gone to 2.46. We had to endure the evils of a fluctuating currency for over two years. On all money sent to the States we lost heavily. So far as our daily expenses were concerned we in the provinces had very little inconvenience to suffer on account of "Mex"; but in Manila all merchants fixed their prices in gold and took occasion to put them up mercilessly. I remember trying to buy some Japanese matting which could have been bought for twenty-five cents a yard in the States, but which was priced at seventy-five cents in Manila. The merchant wanted me to pay him in "Mex" at a ratio of 2.66, or at the rate of two pesos a yard for matting which he bought in Japan at probably less than twenty sen a yard. There was a tremendous protest against the fluctuating currency and the extortion which grew out of it, and we were all relieved when we learned that Congress had adopted the so-called "Conant" system of currency for the Islands. Mr. Conant was the expert who investigated conditions for the Government and devised the system. The Conant system followed the old Spanish values for coins, the new coins being pesos, medio-pesos, pesetas, media-pesetas, nickels, and copper cents. There was also a copped half-cent, but neither Congress nor Mr. Conant read the Filipino aright. In two years we had taught him to sniff at any value less than a cent. The new system is held at a ratio of two to one by the Government's redeeming it in the Philippine treasury at a ratio of two pesos Conant to one dollar U.S. The importation of "Mex" is no longer permitted, and we rejoice in a stable currency once more. We provincials followed the newspaper talk about the new system with no small interest. When our treasurer informed us that he had received a consignment of the new currency, and that our next salary cheques would be paid in "Conant," we were delighted. My cheque, by some accident, got in ahead of those of the other employees, and was the first presented for payment. The beautifully made, bright new silver coins had an engaging appearance after the tarnished mongrel coins to which we were accustomed. When the Treasurer had counted out all my hard-earned money except ten pesos, he produced two bags of pennies, and announced that I should have to take that sum in small coin in order to get the pennies into circulation. They were of beautiful workmanship, yellow as gold and heavy as lead. I called in the aid of a small boy to help me lug home my three bags of coin. I had been at home only a few minutes when in came the regular vender of eggs and chickens, who called at my house three times a week. He squatted on the floor and I sat in front of him in a rocking-chair, watching my little maid drop the eggs into water to test their freshness. After we had chaffered the usual time and had come to an agreement, I went into my room and brought out the bags of new coin. I had bought about seventy-five cents worth from him, and I first gave him three of the new silver pesetas, which he admired greatly. There were still fifteen cents due him; and when I reached my hand into the penny bag and hauled out a handful of gleaming copper, the maid said, "Jesus!" under her breath, and the man, "Dios mio!" He received his fifteen centavos with an attempt to conceal his satisfaction. The maid requested permission to look inside the bag, and when she had done so merely grinned up at me with a look that said, "My! You're rich, aren't you?" It was Saturday morning, and I went on busying myself about things at home. Pretty soon there came a deprecatory cough from the stairway--the local method of announcing a visitor. Outside of Manila knocking or ringing does not seem to appeal to the Filipinos. In the provinces the educated classes come to the foot of the stairway and call "Permiso!" and the lower-class people come to the head of the stairway and cough to attact attention. My chicken man had returned. Was it possible that he had heard aright when he had understood the Se�ora to say that twenty of the new gold pieces went to one peseta? The Se�ora explained that he had made no mistake. Then, said the old rascal, with bows and smirks, since the lady had so many of them--bags full of them--had he not seen with his own eyes?--would she have the kindness to take back those gleaming new pesetas, which were indeed beautiful, and give him gold in their stead? The lady assured him that the new money was the same metal used in the old "dacold" and that in time it would become as dark and ugly, but his Filipino habit of relying on his own eyes was in full command of him. The man thought that I had got hold of gold without knowing it, and supposed that he was getting the best of me. I changed one peseta into coppers for him, and had difficulty in getting him to leave the house. Ten minutes after he had left, a woman came in to sell me some more chickens. I told her that I had just bought, but she put such a price on chickens as had never before come under my ken. Ten cents was acceptable for a full-grown laying hen, the ordinary value of which was forty or fifty cents. I suspected her of having had some information from the old man, and, in order to find out, I gave her the price of the five chickens, which I agreed to take, in the old "Mex" media-pesetas. Then there was an explosion. She reached for her precious chickens and broke that bargain then and there. Her chickens would sell for ten cents gold, but for no media-peseta. I asked her how she knew I had gold, and she said that did not matter--I had some "diutang-a-dacolds" (little dacolds), and she was willing to sell hens for ten "diutang-a-dacolds" gold, but not for media-pesetas. So I counted her out fifty new coppers and we both rejoiced in our bargain. I told her that the media-peseta was worth ten dacolds, but she wanted the bright new money. For the next two hours I was persecuted with truck-sellers. Ordinarily the fishermen were unwilling to stop and sell in the streets or in private houses, preferring to do all their business in the market, but that morning, I could have had the pick of half the catch. Finally came a woman who had had a straight tale from the first woman. Woman number two had nothing to sell, but, after a minute, she pulled out a jagged old media-peseta and said that she had heard that I said that a media-peseta was worth ten of the new gold pieces. If I was as good as my word, why not change her media-peseta for gold? I said that I would do it if she would give me the new media-peseta, but that I could not do it for the old. When she wanted to know where she could get a new media-peseta, and I told her the Treasurer would redeem old silver at the government ratio, she went off to get a new media-peseta, but it was plain that she distrusted me. The people flocked to my house all day trying to get me to buy something and to pay them in the new coins. It was remarkable how easily and quickly one circulating medium disappeared and another took its place. At first there was some trouble about getting the poor people to recognize the copper on a basis of a hundred to a peso. They were willing enough to receive change on that basis, but, in giving it, tried to treat the new centavo as a dacold, eighty to the peso. I had to have one Chinese baker arrested for persistently giving short change to my muchacha, and the Treasurer had a long line of delinquents before him each morning admonishing them that they could not play tricks with Uncle Sam's legal tender. But on the whole the change went off quickly and without much friction. This morning I asked my maid, an elderly woman, if she remembered the old money we had four years ago. She struck her forehead with her hand, and thought a long time. Finally her face lit up. She remembered those Iggorote dacolds and a silver five-cent piece--"muy, muy chiquitin" (very, very small). She said that the Tagalogs called the dacolds "Christinas" after the mother of the Queen-mother. But the difference between a stable and a fluctuating medium meant nothing to her, and probably many of her countrymen have almost forgotten that there was ever any other than Conant in the land. Thanks to Dominic Albert for the scans of coins in his collection. The most common question asked here is what a certain coin is worth. Unfortunately, I cannot answer these questions. Like anything, the value of a coin is established through supply and demand, and two factors are important for this: the relative scarcity of the coin, and its condition. Coins of a scarce type in a good condition can cost many times the price of a common coin in worn-out condition. The age of the coin is hardly relevant: some Roman empire coins, 2000 years old, are so common, they can be bought for a few dollars, whereas some recent coins can cost thousands. Without having the coin at hand, it is very difficult to establish its value. Most common US-era and post-independence Philippine coins are worth a few dollars or less, when in very fine condition. Do not ask for coin values in the forum below. Nobody can answer such questions without having them at hand. Questions for values will be removed. Where can I sell 1987 1oz .999 silver american eagle coin? I have the bronze coin with the little boy on the back and Mt Mayan.....I am looking to sell. ANY IDEALS? Read all 203 comments by readers. your comments on "US-Philippines coins"